What do you think is going on in this picture? Oh, that's an easy one. The snow is alive and those are its varicose veins. Actually, I'm kidding and hopefully you knew that. The snow is not alive. I suspect those are the trails of meadow voles frolicking under the snow while eating all the roots they can get to. I'm so very glad you sent me this picture and I didn't take it in my own yard! Which garden tools are the best for chipping away at ice? Is it acceptable to put your garden hoes to work on such a job? I can not support the use of hoes and other garden tools for ice chopping and general removal of whatever wintry mix you are dealing with. They simply are not made for that and many are not strong enough. Please put those hoes away and get yourself some proper snow removal equipment. That said, Hortense herself used a sod lifter to remove ice from her driveway that had been partially thawed with some ice thaw crystals of some kind. The bag said that the ice thaw crystals were environmentally safe, and she truly hopes that is the case. Though she was careful to keep the stuff off the lawn and planting beds, she still doesn't want it to foul up the creeks which is where the storm sewers carry whatever gets thrown into them off to. Hortense also wonders why she is referring to herself in the third person in this answer. She suspects it is because she has been trapped inside for two days. One really has to be careful out there and inside one's mind, too. If I see one more picture of snow or ice on any more blogs or news websites or if I open one more email from someone who wants to show me their snow drifts, backyards looking like ice rinks, any plant parts encased in ice or other winter type pictures, I think I will go mad. Here is a picture taken in my backyard, which is, of course, your backyard. Isn't it interesting? The snow is not that deep but it is as hard as a piece of Styrofoam. Very interesting, indeed. P.S. 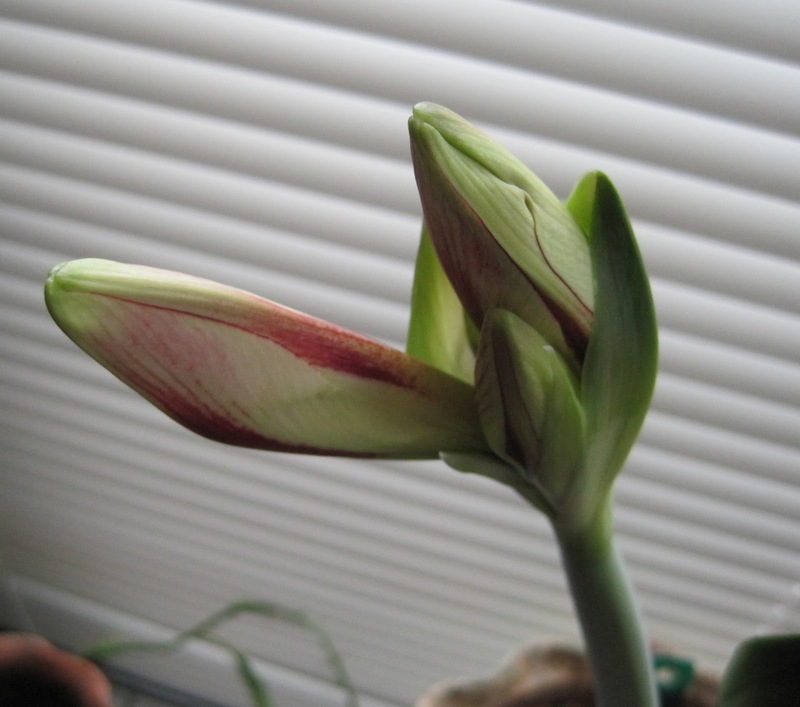 As soon as our amaryllis blooms, you should post a picture of that! Well, there's no snow on MY blog. But even WE are supposed to get some today. Chances in morning and again in evening. Could be 1-2 inches. Which probably means none! I would say stay warm, but after reading your post, I think it more appropriate to say: Stay sane! Oh dear, the sight of vole trails in the snow is all too familiar around here - trying to stay carefully inside my mind, as winter blasts away here in Connecticut. Alton Brown (of Good Eats) would be pleased to know we have multi-tasking garden tools. He always advocates multi-tasking cooking tools. Thanks, again, for the tip of the long-handled dandelion weeder doubling as an ice-walking cane. I nearly fell out of my chair laughing at the "varicose veins". I bet the rest of your characters will have something to say about this ice and snow if you are "in" another day. Hang on, this too shall thaw. I'm not weary of seeing pictures of snow. Your amaryllis is looking good! That first photo is obviously the outline of Taurus the bull, but you knew that and were simply toying with us, right? Glad to hear your tool collection had some useful ice removal gadgets. Sorry, I am one of the guilty. I posted a snowdrift. I also posted my doggie jumping with all four paws in the air. Hmmph. Some of us like snow. I've often wondered why those little creatures don't just come to the surface and enjoy the sunshine. Tell Hortense she needs to chill a bit and embrace the season. Soon it will be warm again, besides, there is beauty and wonder to be found in those Winter Whites. I am very disappointed that I did not see the voles actually frolicking because I truly enjoy a good frolic. Carol and Hortense, you are both funny ladies. Feel free to speak of yourselves in the third person anytime. Speaking in the first person plural, we approve. Indeed. I crave images of actual plants; living things that tell me summer WILL be coming. Also: LOL, ROFL, QWERTY and whatever else it is kids nowadays use to indicate that they have found amusement in something posted on the internet.